Holiday Guide 2017: Best Gifts Under $50 for Her + for Him. There are a million gift guides out there. 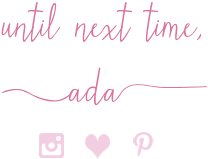 Bloggers, style+fashion websites, magazines, online subscriptions, Pinterest, Instagram, blogs - it looks like everyone has a gift guide this Holiday Season. I like to look at most of them actually because I like to see what others think and what fellow bloggers for example suggest as Christmas presents. I believe no two guides are alike. I, however, haven't looked at almost any shopping guides this year because 1] I haven't had time and 2] I have my own guides and my own ideas. But I definitely think we can all help one-another and learn from one-another so these gift guides are a great idea. 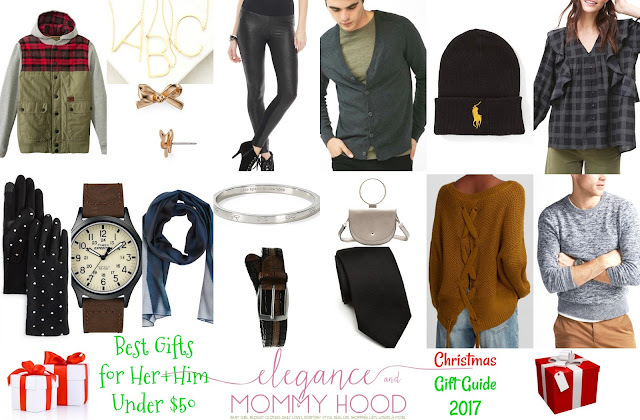 Today, I compiled a gift guide with 16 items I love, all under 50 bucks which you can buy for Him or for Her. You will see them all in detail below, after the collage. But I must say that if not one, another one of these presents will satisfy even that lady or gentleman that is hard to buy for. Take the two men's sweaters for example: they are both classic and versatile and bonus points since they are in neutral colors. And that plaid blouse in dark tones will satisfy the plaid-lover in your life, like a cousin, sister or best friend. This season I think some cute accessories and Winter accessories make great presents too. The two-tone black+brown leather belt for the guys is the kind of belt they could pair with black, brown, camel or tan. The beanie and tie are both black and they go with everything, while the tech-friendly black pearl gloves for her are elegant, classic and very versatile - they can use their cellphone with them. I also think no lady will hate a beautiful initial necklace, a sleek+chic silver bangle or a pair of sweet+girly bow studs. The rest of the clothing includes a hooded quilted olive green and red plaid jacket which is for the sporty, adventurous guy or a fun laceup-back mustard sweater for the trendy fashionista. We have had horrible weather these last couple of days and it keeps getting worse by the minute. It is pretty much not drive-able outside with our 6 to 9 inches of snow on the ground and it is sill falling hard. I didn't even make it to work today. One of the cars broke down - I am sure the crappy weather had to do with it a lot. 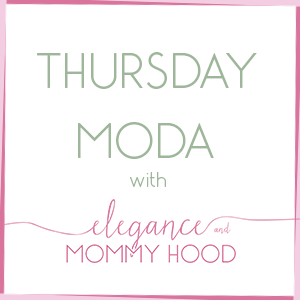 I don't know when exactly I will be posting the Thursday Moda post tomorrow but I will leave the linkup open for you below, just in case. I wish everyone is safe and warm out there. If you are in a state that has a lot of snow, avoid going out unless you have to and please please drive slow and drive safe and don't forget to dress warm. Say a prayer for us guys. Michiganders can use it - this snow storm is awful!